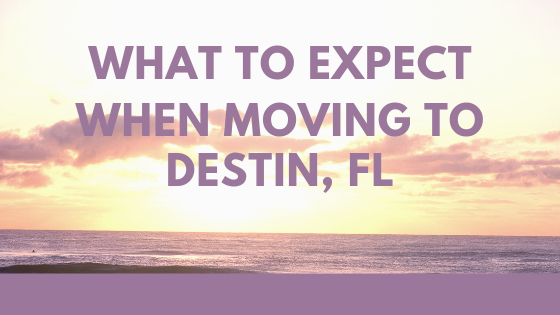 No matter where in the world you move from that places you in Destin, Florida, the first thing you can expect is a warm welcome, sunny days, star-spangled nights, an occasional soothing thunderstorm, and lots of friends and family to come visit you. With some of the best sugary-white beaches in the US, it’s a fabulous area for working and playing. It’s not just a vacation destination anymore. With average temperature of 75 degrees, who wouldn’t want to live here year round. Please note, that our summers are hot, but that’s not a problem when you have gorgeous beaches to relax on! Destin is a live/work/play community. Retail sales, service, technical, craftsman or professional jobs are available across a variety of industries. Unemployment is 3%. That is 37% lower than the national average making us an attractive place to work. Per Capita Income is 34% higher than the national average as well, this makes for a nice living in paradise. We offer “Extended Summers” in Destin: January 1 – December 31. Our beaches only close if there is a hurricane. So trade the Parkas, snow boots, and wool caps for shorts, sandals and T’s. With the beach at your doorsteps, our extended summer months are great for outdoor water sports and there are plenty for anyone with an active lifestyle. Parasailing, jet-skiing, boating, water skiing, offshore fishing, sailing, biking and swimming all await your arrival. Watercraft can be rented by the day or half-day. (Remember, safety first. Always wear floatation equipment.) 18-hole golf courses are within a short distance of downtown. Even golf clubs can be rented!! Or if you are ready to jump right into the Florida lifestyle, great deals can be found on these Florida toys all year-round. An outing at Henderson Beach State Park is less than 4 miles from downtown. It is a great way to show off to your friends and family the beautiful white 30 foot sand dunes that you can call “home” in Destin. Walk along the quiet beach at night listening to the waves crashing against the shore, the smell of the salty sea air, and the caw of a nearby sea gull before you stroll home. If you think you are seeing ghosts, you are, those little critters you see running along the sea line are called ghost crabs and truly look ghost like. Or…..if you prefer a little more excitement at night, Destin offers lots of clubs with live entertainment, restaurants and bars to suit every lifestyle. Most locals like to hang out at the boardwalk at Harbor Village. Our unique little town of 14,000 full time residents has lots of festivals for all ages. Image enjoying the outdoors – ALL.YEAR.LONG. If there’s time left in your schedule to further your education, nearby Northwest Florida State College, offers degrees in Business, Health Sciences, Education, Public Safety, Industry, Manufacturing and Construction, Humanities, Arts, Communication and Design, Science, Technology, Engineering and Mathematics, along with Social and Behavioral Sciences. We have your field. Come for the education – Stay for a lifetime. Conveniently located in Destin, FL is Sugarloaf Luxury Apartments. Begin your transition to our small but close knit community and live the life you have dreamed of. Come on – what are you waiting for? The beaches are waiting for you.